With property prices soaring in Penang, the shortage of affordable housing remains a huge concern for people in the state. Despite the move by the state government with the Penang Development Corporation (PDC) to initiate several projects which will deliver more than 22,000 units of affordable housing in the next five to 15 years, there is still a growing worry that this will not meet the demands of prospective buyers. Homemaker Faridah Mydin, 62, is a long-time resident of the People’s Housing Project (PPR) low-cost flat scheme in River Road, Sungai Pinang. The former hawker has lived in the cramped rented flat for the past 12 years because she cannot afford any other property. Her household comprising herself, her husband, four children and four grandchildren are making do with only three bedrooms to share in the 500sq ft unit. “Yes, it’s very cramped but what other choice do we have? We cannot afford any other place. “At my age, I may not need a new or bigger house, but I hope my children and grandchildren will be able to live in a more comfortable home. “My daughter who just got married has applied for a RM72,000 low medium-cost home but she has been on the waiting list for quite some time,” said Faridah when met at her home. Saadiah Mohd Yusoff, 57, lives in a cramped unit with more than 10 family members comprising her husband, six children and four grandchildren. “We’re a big family but we can only afford the monthly rental of RM102 here because houses are so expensive. We cannot afford to move to a bigger home. “Some family members who are not working depend on my husband who earns only around RM1,600 as a garbage truck driver. “There really isn’t enough low-cost and low medium-cost houses in the state for low-wage earners like us,” she said. Another neighbour, who wished to be known only as Anna, 40, lamented that it was difficult to think about getting a new home when her family was already struggling with the rising cost of living. “Of course, everyone would like to have their own property but how is it possible when property prices are soaring like there’s no tomorrow?” she said. “The price of a small apartment is unimaginable to me,” she added. The babysitter has been living in the same flat with her husband and three children aged 20, 18, and 12 for the past 14 years. “My husband earns only around RM2,000 a month, and I about RM250,” said Anna. “We have two schoolgoing children and their expenses along with other household expenses need to be taken care of month after month. “We don’t even have enough left to save up for a home. Even a RM70,000 home is cutting it close for us and homes of such prices are not many,” she said. Ban chang kuih (pancake) seller Ooi Beng Keat, 36, has been living at a small flat in Taman Free School for the past five years with his wife and their young son. He said he hoped the state would build more affordable housing units which do not compromise on space and quality. He said his wife had registered for a unit in an affordable housing project initiated by the state and PDC but had not received any news on the application status. “I believe there is a long waiting list but we hope to get a RM72,000 low medium-cost home which will be much more spacious than our current unit,” said Ooi when met at his stall in Perak Lane. Meanwhile, Opposition Leader Datuk Jahara Hamid said the state had raised a lot of hope that had not been delivered to the people. “It’s not fair for the state to keep potential buyers who registered for affordable housing at bay for so long. “In the meantime, people have to find other alternatives and there is not a good mix of low-cost homes and low medium-cost homes in Penang. “The state government, through PDC, should intervene by providing all categories of housing,” she said when contacted. Jahara said it was also time the state government “walked the talk” on the issue, adding that the state and the Federal Government should cooperate to build more homes to resolve housing woes. 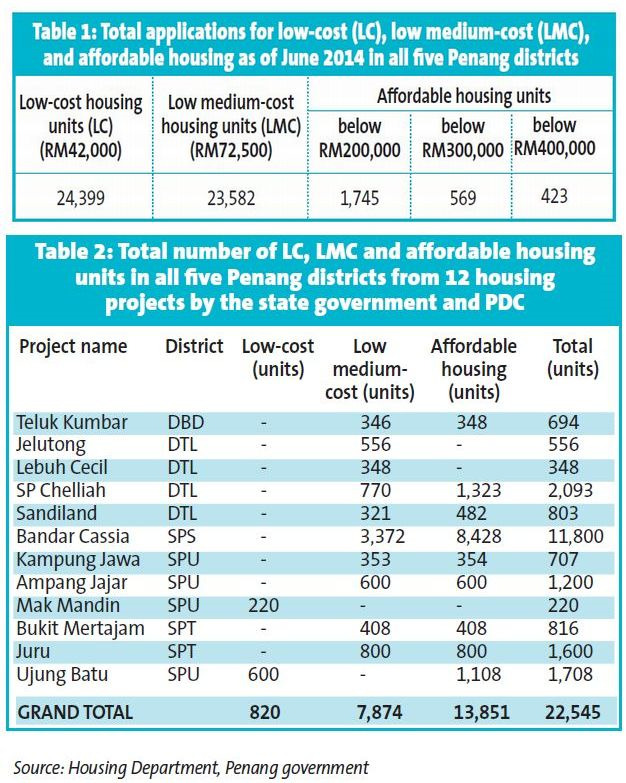 State Housing, Town and Country Planning Committee chairman Jagdeep Singh Deo, when interviewed, said that as of June last year, there were 24,399 applications for low-cost (LC) housing units priced at RM42,000 and 23,582 applications for low medium-cost (LMC) units priced at RM72,500. A total of 1,745 people registered for affordable housing units priced below RM200,000 and 569 had applied for affordable units priced below RM300,000. Affordable homes priced below RM400,000 drew 423 applications. He said deserving applicants for the LC, LMC and affordable housing units would be chosen by the Selection Process Enhancement Committee which was set up in August 2013. The committee comprised eight elected representatives including himself as chairman, Jagdeep added. “In 2013, 1,788 applicants were selected while 5,503 more were selected as at September last year. “Priority is given to deserving applicants such as the disabled, single mothers, those with health problems, flood victims, and those forced to move out due to development,” said Jagdeep. He said the Penang government, together with PDC, had embarked on 12 LC, LMC and affordable housing projects which would see 22,545 units being built in all five districts in the state. “On the island, the projects are in SP Chelliah, Teluk Kumbar, Jelutong, Pintasan Cecil and Sandilands. Planning of infrastructure , transport , buses etc should be in tandem so that people can get to work and shops cheaply . Reduce motorcycles especially and cars !